Hello. Today I am sharing a card that I made a year ago at my stamping club but never posted. 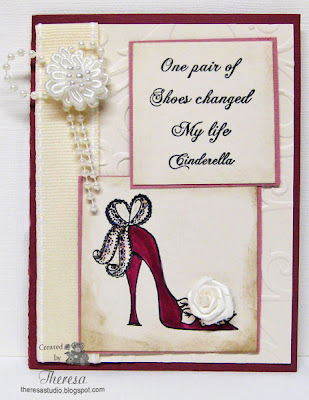 The stamps used were by Great Impressions Stamps called "Rose Shoe" and "Changed My Life". Black ink was used to stamp on ivory card stock squares and edged with pink inks. The shoe was colored with markers with a touch of glitter added to the bow. Dark red card stock was used as base with an ivory mat embossed and embellished with grosgrain ribbon and a flower with pearls. Image and sentiment were added with pop up dots. A fabric rose was then attached to the shoe. All supplies were provided by friend Pat. Welcome! Today, I am posting a birthday card that I made for someone who will be celebrating her 18th birthday soon. Since she loves surfing....she lives by the beach on Captiva Island, FL....I wanted to reflect her love of surfing and the beach. I happened to come across a photo of her surfing and printed off the picture and edited it to look more like a watercolor with photoshop. 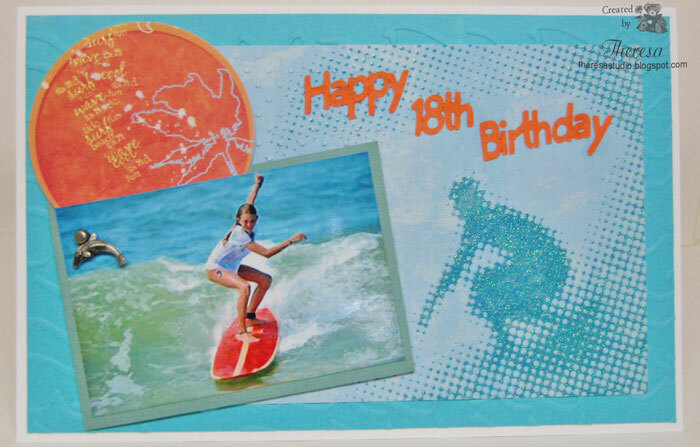 I started with a white card base, layered with a mat of blue embossed with ocean waves using a Sizzix Texture Pad, and layered with a 4x6 printed paper from DCWV Tahiti Beach Stack that has glossy glitter. I cut the circle from another paper from the same stack and topped with the photo matted on a sea green card stock. The circle and photo are attached with pop up dots. I finished with a Dolphin charm attached with a brad and the sentiment cut with Cricut from orange card stock. The card measures 5.5" x 8.5". This is one of those cards that looks better in real life. Click on the video below to hear "Let's Go Surfing". Thinking of the beach as we will be heading to Florida and warmer temperatures soon. I am back with another snowy cottage for the challenge at Craft a Scene This time I have used 6 stamps from GKD "Life is Good" Set by Theresa Momber. I used the triple time stamping technique and a sketch from Speedy Fox Challenge. The stamping was done with Memento Rich Cocoa ink and colored with Copics with a bit of sponging with Brilliance Moonlight White and Memento Summer Sky. I extended the walk to the bottom edge of the card Added a bit of stickles to highlight the snow. This time I remember to start a roaring fire in the fireplace of the cottage resulting in smoke from the chimney. I like the way this turned out using the triple time stamping. After adhering the dark brown card base and brown cardstock mats with the image layers, I stamped the deer again, cut it out, and glued it to the top to make it stand out more. I finished with a sentiment in brown ink. MFP Sketch With a Twist Challenge #30: Use sketch shown below and with a twist of using layers. 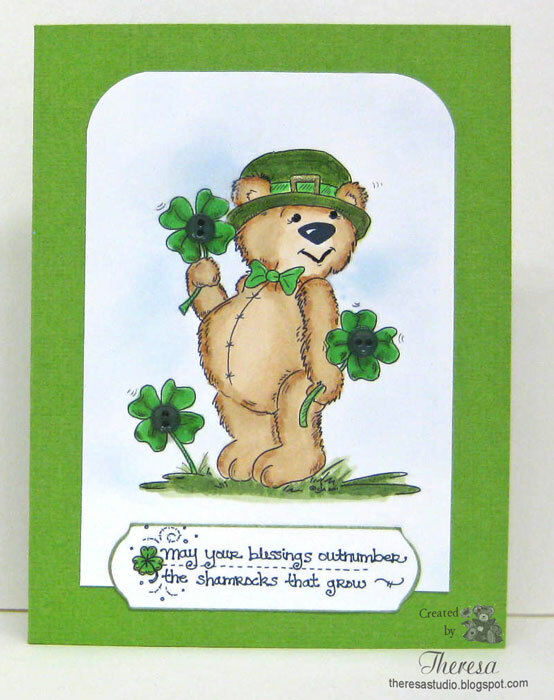 All Sorts: Create masculine card. Do you wonder what is the definition of a cottage? I wanted to be sure this image fit the challenge so I check the definition. A cottage is a small simple, single-storied house, especially in the country, typically one near a lake or beach. I think this image is just right. I love making Valentine cards...maybe it's partly because I love the color combo of red, black, and white which can be so clean or dramatic or any style you wish. That would be a good challenge...any way you wish! 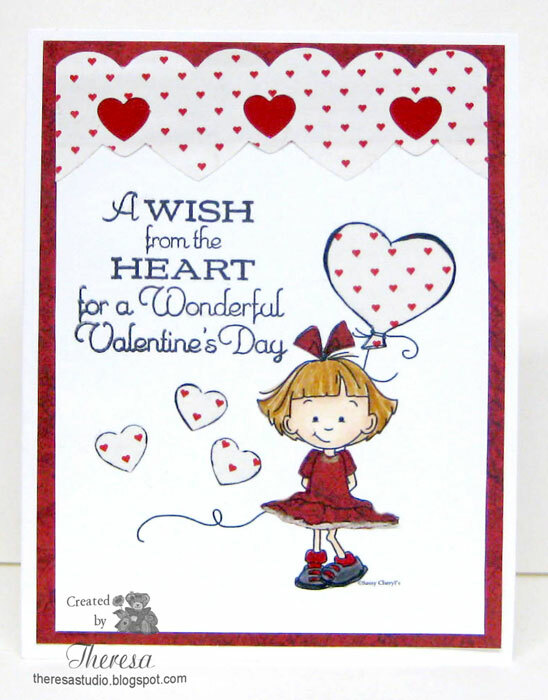 I just had to have this new release from Sassy Cheryl "Sassy Sally's Heart Balloon"...she is so cute! I decided after printing her on white cardstock to paper piece her dress, bow, and balloon using some scraps from stash. I colored her with Copics, I used a border of hearts at the top edge of the card over a red satin ribbon that shows through the small cut out hearts. Not to waste anything, I added some of the small hearts as if to show they are falling from the top edge. The card base is white and the mat under the image is the same DP as her dress. Simon Says: Let's get Paper Piecing. Whoopsi Daisy Challenge: Use a digi. Shopping Our Stash Challenge: Use your oldest ribbon. This is an old acetate satin ribbon that I have had before I started carding. Must be 10 years +. Behind the cutout hearts. Digital Tuesday Challenge: Favorite color combo. Must be fave combo of red, white, and black. 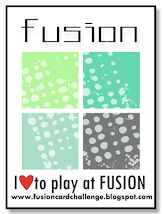 Fab 'n' Funky Challenge: Use your favorite color combo. Red, white, and black. 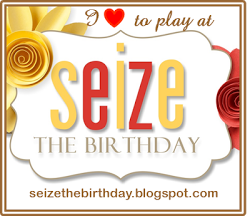 I did not mean to post 3 cards today but might as well get it down. 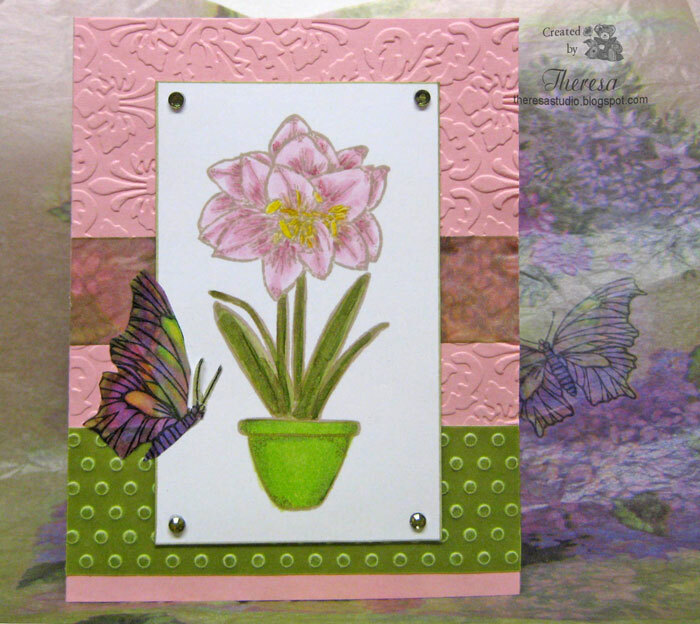 This card was made for Joan's Garden Challenge. The card needs to be pink and white, use at least one heart, and use a pretty border. I had planned a more fancy card but it turned out more on the clean and simple style. 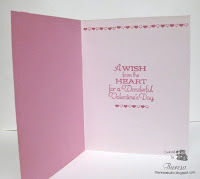 I cut a heart with a die and filled it with ribbon on the backside of the textured pink card base. I stamped the sentiments on a White heart and attached beneath the ribbon heart. 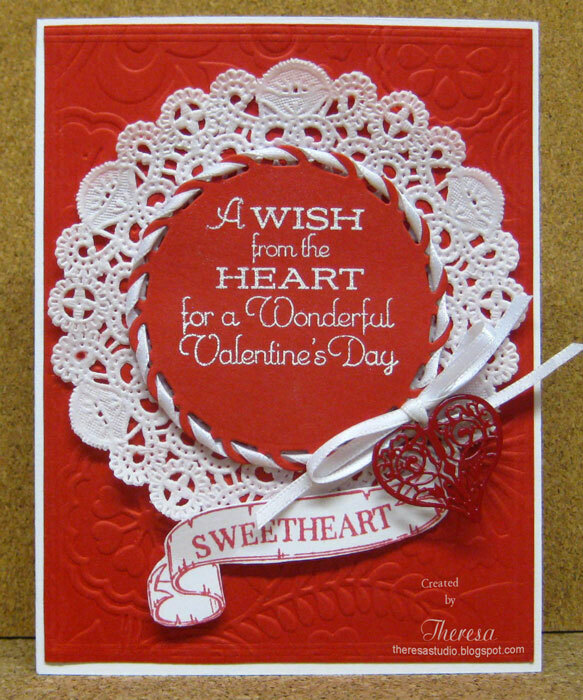 The right edge of the card was punched with scallop dot border and I wove a narrow white satin ribbon in the holes and added a strip of the same ribbon filling the heart. I attached a darker pink cardstock(matching the ribbon) to the back of the front of the card to hide the edges of the ribbons. Finished the inside (shown below) with more hearts and a sentiment. I found several challenges to enter this card. Joan's Garden: Card needs to be pink and white, use at least one heart, and use a pretty border. Really Reasonable Ribbon Challenge: The theme for Challenge #64 is Valentine's Day/Love & Ribbon. 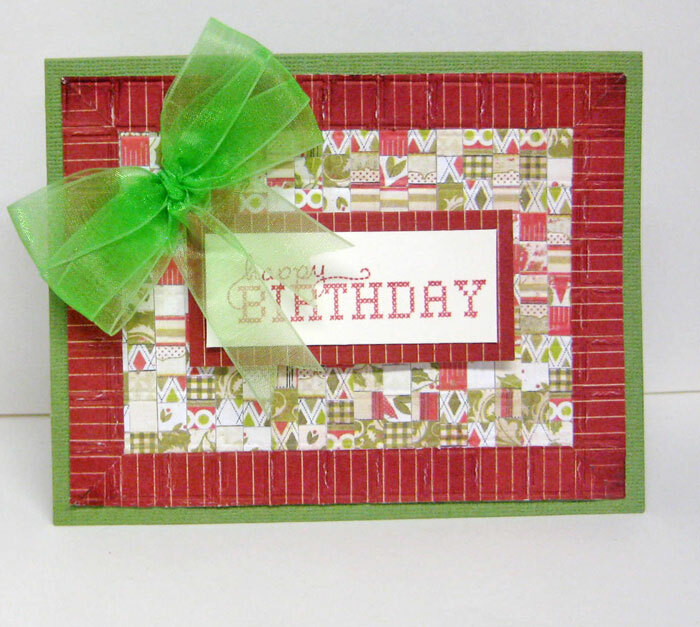 Friends of Speedy TV challenge: Make a card using creative use of ribbon. 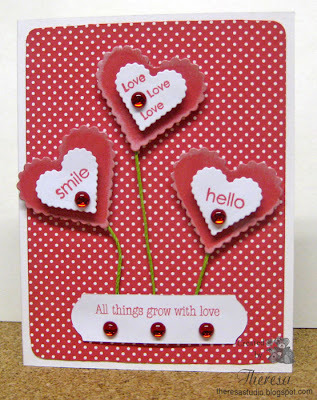 City Crafter Challenge Blog: Make a card using hearts. Sweet Stampin' Challenge: Theme is ribbon. While posting this card I was reminded of the song "Heart of My Heart". Play by clicking on video. We had more snow yesterday. I plan to stay in today and make cards. This card was started sometime ago and recently finished but never posted. I used 1/4" strips of DP that I taped on a card stock and then cut into 1/4" strips and then made into a quilt. I was inspired to make this sometime ago from a card by my friend Lin at Sending Hugs but do not have the post to link too. She makes so many beautiful cards. I layered the "quilt" on to a border of striped DP strips using mitered corners to better replicate a finished quilt. I attached this to a card base of green. Finished with a sentiment and triple organdy bow for my Mother's recent birthday. Papertake Weekly: Tie up your loose ends-add a bow. Welcome. We have snow and cold here in Ohio. Guess this weather set the mood to create a snowy cottage scene. I have had the monthly challenge at Craft a Scene in mind which is to do just that -create a snowy cabin scene - and the month will soon be over. I am not sure I like the results but it is certainly snowy card and includes a cottage/cabin. I may have over done the snow a bit using stickles. I have used this stamp before and it's fun to do with a different look each time. 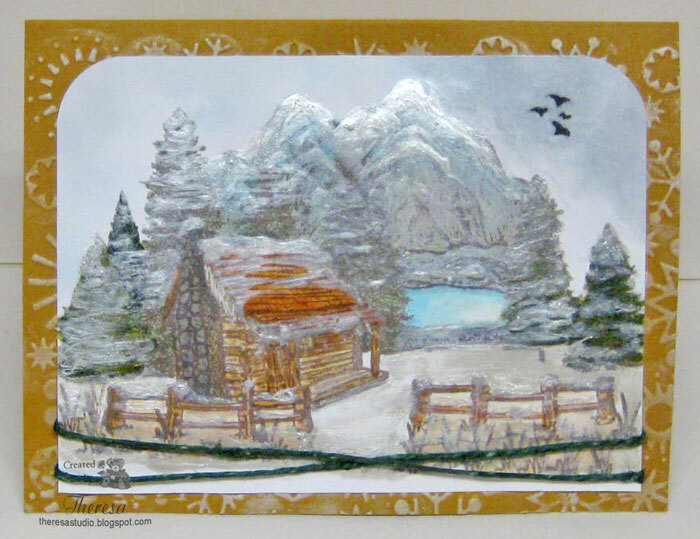 I stamped the cabin with mountains and lake and added some more trees, the fence, and birds which added more depth to the scene. I colored with a lot of Copics, sponged the sky to give a snowy and gray look, and then let the snow fall everywhere. Even the lake looks cold! Finished with a bit of green twine. The card base was embossed with snowflakes and sponged with Brilliance Moonlight White. I did not use a sentiment as I will stamp that when I use the card. 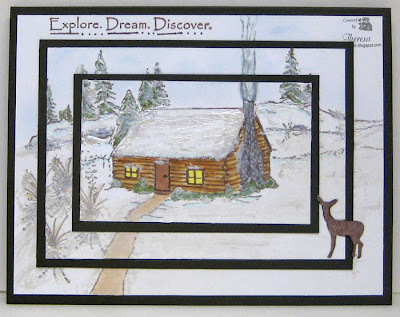 Craft a Scene: The theme this month is to create a snowy cottage scene. Stamps: MFP's "On the Fly" and "Scenic Selections"
Al and I have been away on a trip to Tennessee to visit my Mother to celebrate her 93rd Birthday this past weekend. She is a very young 93 who enjoys keeping active cooking, watching sports on TV, playing cards, knitting, and still does quilting. We enjoyed our visit with her and other family members. I am sharing a picture of when she met Patrick Willis, the 49ers Linebacker who is from the same town in Tennessee. He was visiting his family there last year and she met him at a local restaurant . She is a big fan and was thrilled when he offered to pose with her for a photo. 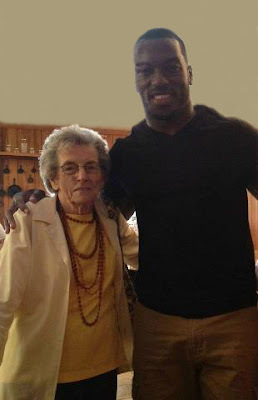 Her 13 year old great-grandson, Evan, was very impressed with this picture of his great-grandmother. We watched the ballgame on her birthday Sunday when the San Francisco 49ers beat the Atlanta Falcons to be in the Super Bowl Game. Guess she will be watching that game for sure and cheering on Willis. No card for today but wanted to share this picture of my Mother. Thanks for stopping by. 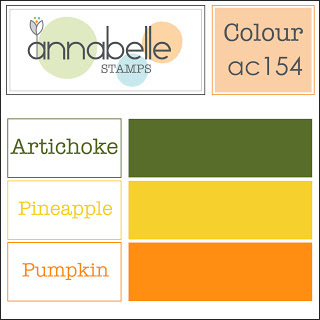 Today's post is a card for Annabelle Stamps Challenge- a color challenge to use Artichoke, Pineapple, and Pumpkin. 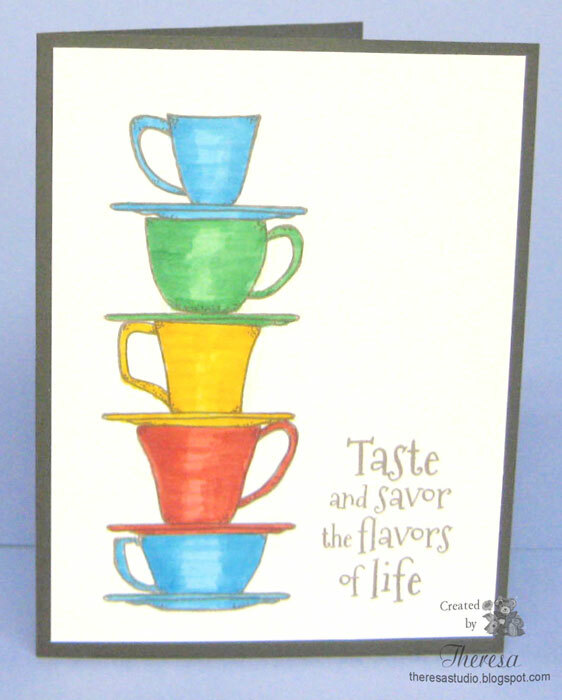 I selected 3 solid cardstocks from my stash that best matched the colors shown on the graphic and used the papers to create my design . 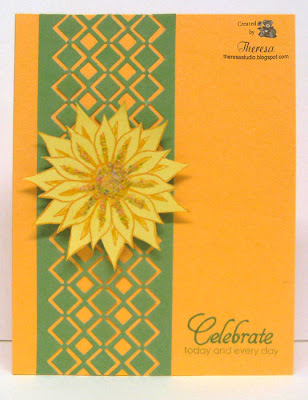 I used the pumpkin for the card base and layered it with a strip of green cut with Annabelle Border 1 die. I stamped the flower using Annabelle Squared Poises stamp set and Memento Tangelo ink. I cut out the flower, added some flower soft and popped up on the card with foam dots. Finished with a sentiment from the same stamp set. I received this digi image from Doodle Pantry and decided I must use it for their challenge this month which is to use a Doodle Pantry image....that's simple enough. I printed the image on white cardstock and colored with copics and a black glaze pen. I used papers from stash and scraps of green which is almost a heavy vellum. I embossed the card base with Cuttlebug EF Wickerweave and assembled the layers. 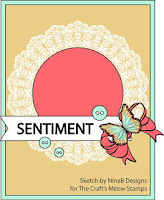 Sentiment is from Creative Vision was cut with Nesties Blossom Dies. I am trying so hard to use up bits and pieces of scraps ....one of my objectives for the new year. Doodle Pantry Blog: Theme is to use a Doodle Pantry Image. I used Pansies. Thanks for dropping by. Love to read your comments. 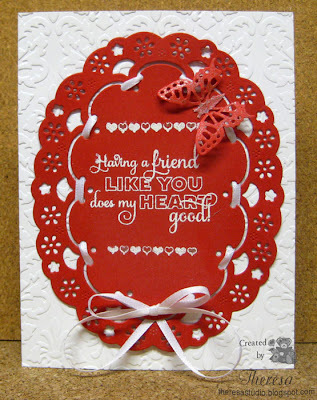 When I was cleaning my studio this weekend, I found some Iron on Applique hearts and thought, I'd make a card with one. 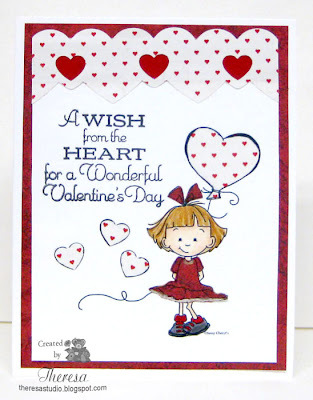 I did this quick one layer card for One Layer Wednesday Challenge from Cheryl to create a card using hearts or a heart, whatever your heart desires! On white card stock, I punched a scalloped heart with a new EK punch and adhered the heart applique in the opening. I added some scor-lines and embossing with Cuttlebug EF With Love Borders....3 rows of the dots and the sentiment. I colored the raised areas with Ranger Distress ink Barn Door Red. I put a lot of heart in this card. 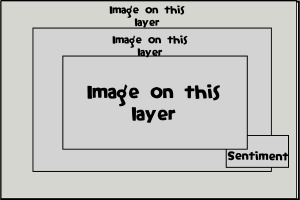 One Layer Wednesday: Use heart or hearts on One Layer. 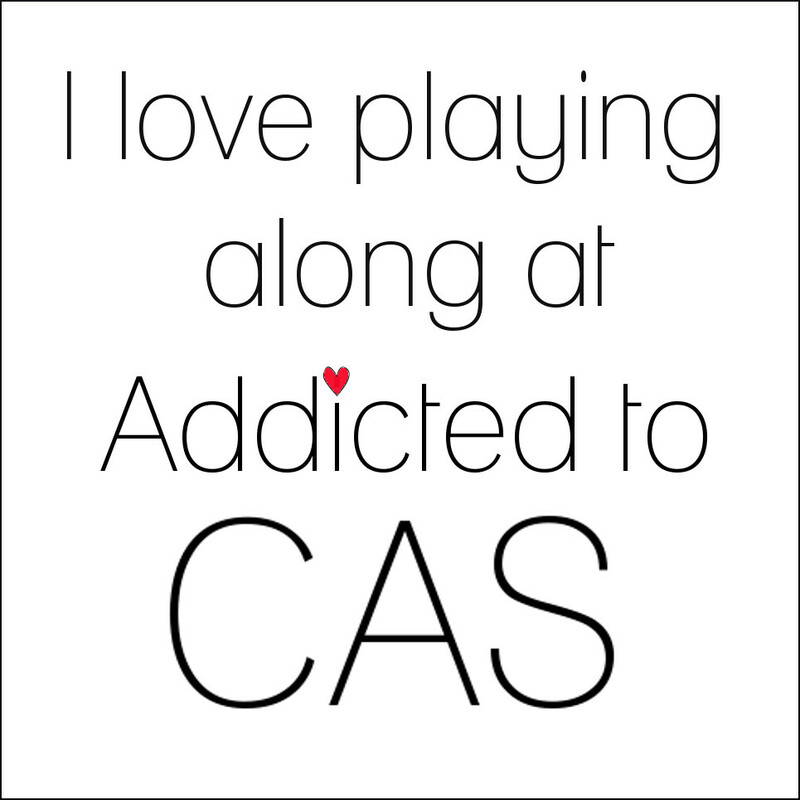 I am down to the wire for deadline for entering Sassy Cheryl's Challenge to make a CAS card. I think this fits the challenge. I simply printed the The Saint Bear digi and colored with Copics and a Gold glitter pen for the buckle on his hat. I sponged a bit of Memento Summer Sky ink behind the bear. I used a Green Card Stock from my stash. Finished with a printed sentiment from Meljens that I cut with a Spellbinders word die. Added some small green buttons to the Shamrocks. Sassy Cheryl Challenge: Let's keep it clean. Shopping Our Stash Weekly: Use your old buttons. The little green buttons have been in my stash a few years. Crafty Catz Challenge: Buttons and Bows. I've got the buttons well covered but I may be stretching it a bit for a bow....but he is wearing a bow tie. All Sorts: Dies and Punches-used a corner punch and a word die for the sentiment. Welcome to the Sweet Life. 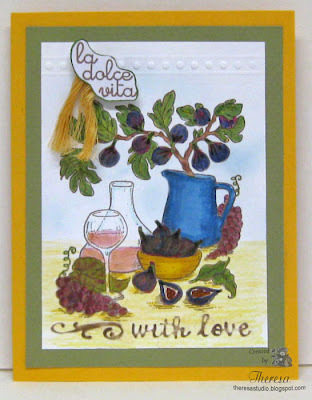 My card depicts a sample of the Sweet Life...maybe time spent at an Italian villa enjoying wine with fresh figs and grapes. This is the first time I have used my new stamp from Flourishes called "Dreaming of Florence". 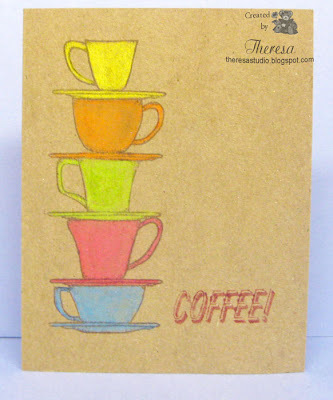 I stamped on white CS using Memento Rich Cocoa and colored the image with Copics and Pencils. I tried to capture the natural colors of grapes and figs and a rose wine in the glass and container. 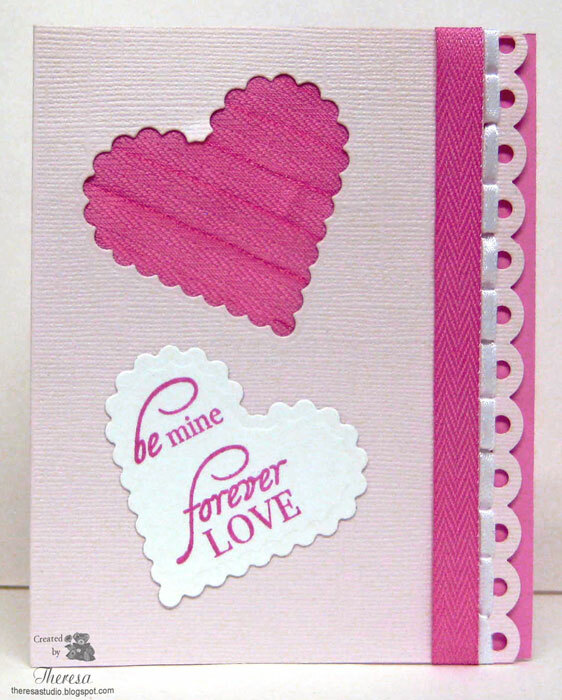 I embossed the top and bottom edges with Cuttlebug borders from EF called With Love. Keeping with a rustic look, I used a simple layout of a gold card base with an olive green cs mat for the image. Finished with the simple sentiment "La Dolce Vita" and a touch of raffia. All papers were from stash and scraps. Flourishes Timeless Tuesday 202: This week’s challenge is to make something “New.” I used this new stamp received in December. Papertake Weekly Challenge: Happy New...used new stamp set. I hope you are enjoying la dolce vita.....the sweet life. PS: I have spent part of the weekend cleaning and organizing my studio....and made a new light box from foam board. 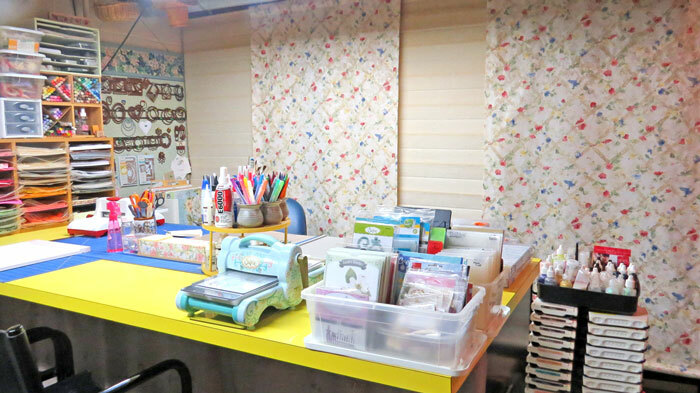 It is a sweet life to have a neat place to craft. 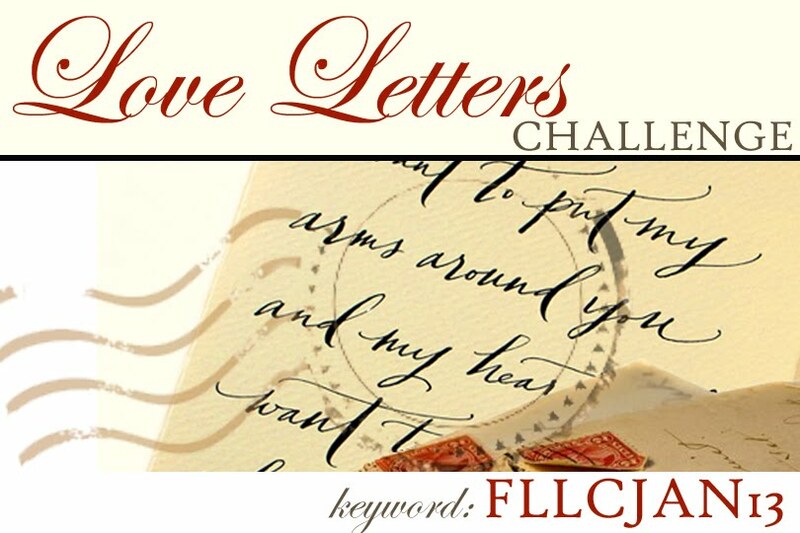 This is another card for Flourishes Love Letters Challenge and another chance to win their January Release. This challenge is a broad one that’s all about LOVE — use love as your theme, use letters as a focal point, or use the colors of love in shades of pink and red. The choice is ours. 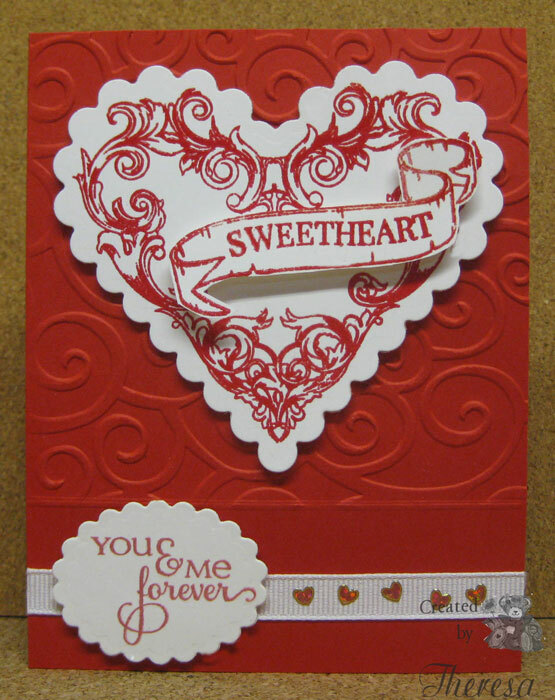 I selected the stamps from Flourishes "From the Heart" and "Love Sweet Love". These are perfect sets to use for this challenge. 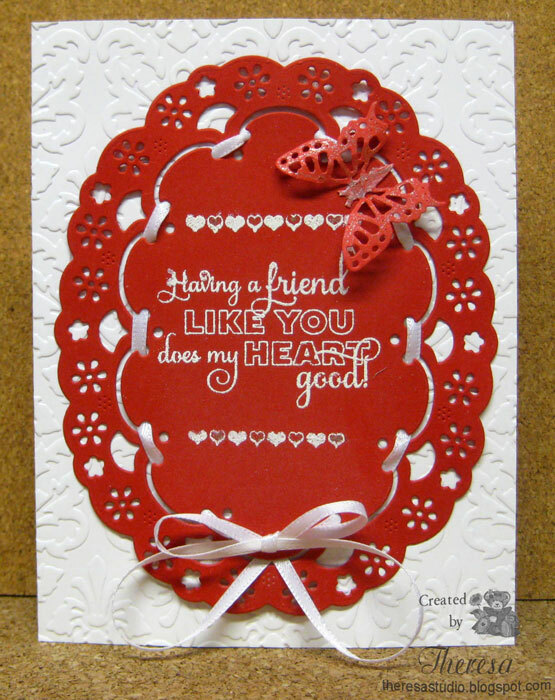 I stamped the heart with Versamark and embossed with red embossing powder on white CS. I did the same with the Banner and Sweetheart stamps. I cut the heart with a Nesties Scalloped Heart Die. For the base card I embossed red cardstock with Cuttlebug EF Divine Swirls and did some score lines. I added a white grosgrain ribbon and the sentiment on a scalloped oval. Finished with some "dancing" Heart Stickers from my stash. Share some love with your loved ones today. Thanks for stopping by .....love to you all. Welcome! Today I am posting this card on my new laptop that my husband gave me so that I will be able to post easily while I am in Florida in a few weeks. Now I will not have to bother him to use his computer. Isn't he the greatest??? I love him!!! I am been playing the past few days loading the programs and files I will need. 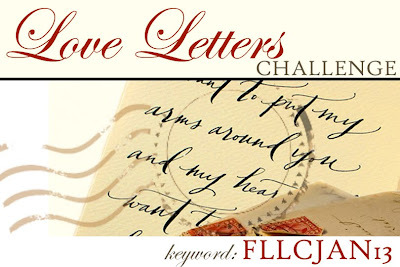 But I took out some time to make a card for Flourishes Love Letters Challenge with the hope of winning their latest releases. And also to tell my DH what I love about him. This challenge is a broad one that’s all about LOVE — use love as your theme, use letters as a focal point, or use the colors of love in shades of pink and red. The choice is ours. 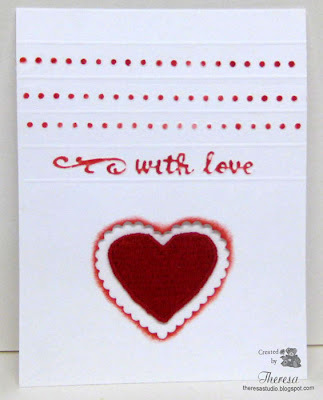 I selected the stamps from Flourishes"Love Sweet Love". I stamped the basket which I have not used before on GKD White CS with Memento Toffee Crunch. I colored with Copics E0000,33,34,39, G82, R81,83,85 , Y11, and C1. 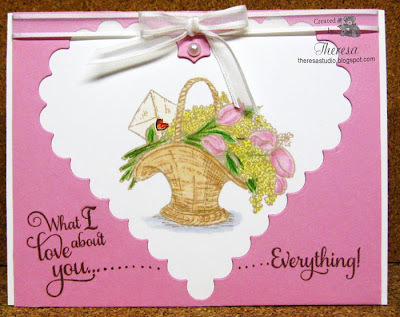 I added a heart sticker to the love letter envelope in the basket. I cut a heart from Bubblegum Pink CS with Nesties heart die and layered this over the image. Finished with the sentiments stamped in Memento Rich Cocoa. Added some white satin ribbon and pearl on the top edge. I hope my DH gets the message of love from my card! Did I tell you that he is the GREATEST? 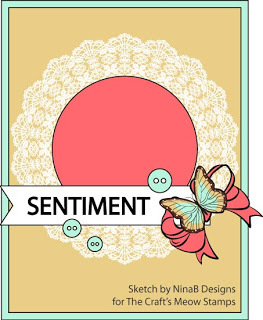 The challenge at City Crafter is to use a Vintage Girl and/or Vintage Boy in our project. I remembered a silhouette digital image from Graphics Fairy in my file and thought it would be perfect and married it up to a pattern paper that has a vintage feel. I "antiqued" the image with some distressed ink and distressed the edges before attaching to a sage mat. I used a Sage card stock base with a mat of the pattern paper that I embossed but hard to see the embossing. Finished with a satin looped ribbon and a sentiment. It captures a moment in time to cherish in one's memories. City Crafter: Use a vintage girl and/or vintage boy. 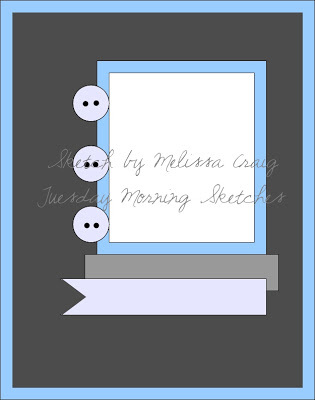 BasicGrey Challenge: Anything goes. Used pattern paper from Cappella Pad. 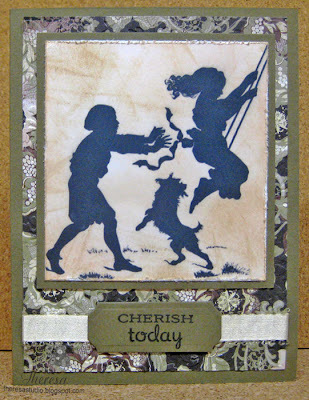 Simple Salutations Challenge at Speedy TV: Use a dog in your card and a sentiment. The Corrosive Challenge: Out With the Old. Used old ribbon, old pattern paper , and a digi that I have for a long time.This is a new found challenge...first time here. 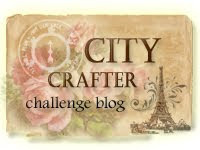 Craft Your Passion: Challenge is vintage/shabby chic. Stamp: Graphics Fairy Digi, Flourishes Sentiment from "Strawberries"
I am back again today with a quick post for the Cheery Lynn Design Challenge Friends/Friendship. I made a Valentine card for a friend using Cheery Lynn Dies Swedish Spring Oval Frame and the Small Butterfly dies. I framed a sentiment and hearts from Flourishes Heart Lines stamp set. The stamping was done with versamark and embosssed with white embossing powder. I looped a white satin ribbon through opening in the cut frame and tied with double loop bow. White card base was embossed with Cuttlebug EF Kassie's Brocade. Finished with the butterfly colored with clearstar pen for sparkle. This card was a result of combing some challenges and using some new products including a new embossing folder called Villages and a new stamp(new to me) from Unity called Neighbor. 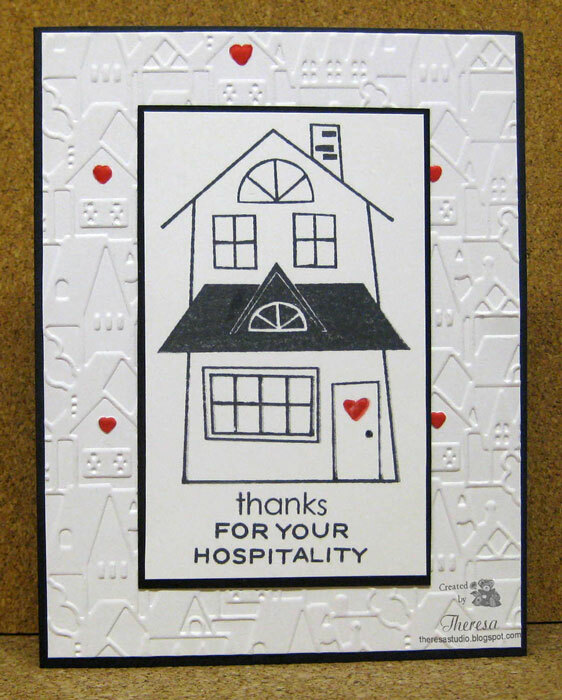 I used a card base of black and layered with an embossed mat of white card stock embossed with Villages. 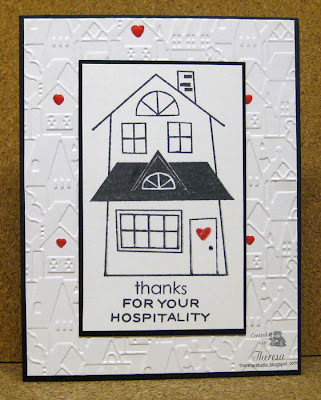 I stamped the house in black and red (for the heart) on white card stock that I trimmed and placed on a black mat . I used two sentiments to create a thank you card. Added red ink to the hearts in the embossed design. 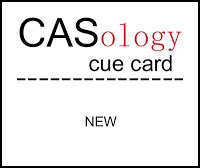 CASology: Cue is NEW. I used some new products on my card. The ABC Challenge: E for embossing. Stamps: Unity Itty Bitty "Neighbor", Flourishes "For Your Hospitality" from Taglines, and Annabelle Stamps "Thanks"
It is so nice to have time to play and I am trying to use some of the digis that I have not used and some new papers as well as old scraps. It is fun to try to catch up with some of the challenges that I have missed entering the past few weeks. 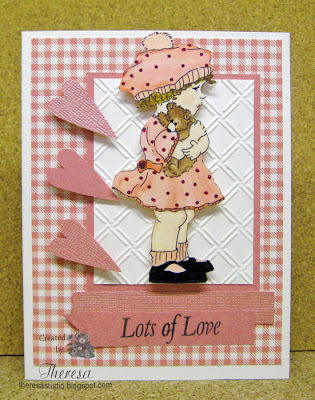 This card uses a digi image from Sassy Cheryl called "Share the Love", a sweet little girl with her Teddy Bear. I have used the sketch from Tuesday Morning Sketch Challenge and my card ended up with a monotone color theme. I chose a paper from a new Pattern Pack by GKD called Petals and Wings which inspired me to use a Coral Color theme. I colored the image with Copics which I fussy cut and attached with pop up dots as well as the hearts. Tuesday Morning Sketch: #179 Shown above. Scrap Creations: Use something new to us. Used the lovely gingham check paper from Christmas. Sweet and Sassy Digi Challenge: Something New..I used new pattern paper. What new items did you receive for Christmas? I seem to be into Valentine cards now. I made this card for some challenges including The Craft's Meow Monthly sketch challenge and Stamptacular challenge to use doilies. I began with a base card of white, a layer of red that I embossed and then toppped that with a doily. I cut a lacey circle and stamped with Versamark and embossed with white ep and then wove a ribbon through the loops and tied off with a bow. To this I added a filigree heart charm and attached all to the center of the doily. I finished with a banner stamped with "Sweetheart". The Craft's Meow Sketch Challenge: Sketch shown below. Simon Says Stamp: Use something new. Used new GKD red paper from Christmas order. My card today uses tissue paper that I made into washi tape using scor-pal tape. I added an one inch strip to the front of card. I used half inch strips inside my card but forgot to photograph. 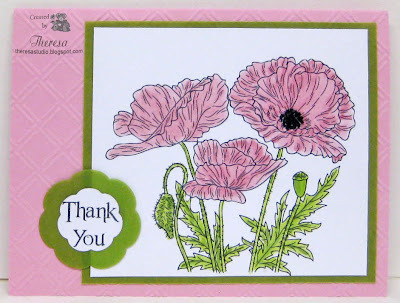 I used the floral tissue paper shown as the backdrop behind the card. Needing an embellishment, I cut out the butterfly design from the same paper which I backed with tape before cutting it out. This resulted in a handmade sticker which I attached to the card. The Sweet Stop Sketch Challenge: SSS191 shown. Speedy Fox and Friends Challenge: #140-Use tissue Paper on project. Tissue Paper saved from a purchase. It has been too long since I made a card with a LOTV stamp...the one I have used is Dancing Bears and I thought they would be so cute all dressed up and dancing away on New Year's Eve. I paper pieced his bright blue tuxedo, added some glitter on his bowtie and black rhinstones for buttons. I colored her party dress with copics in a bright color and added a lot of glitter to her dress, shoes and bow. I added her necklace with gold glitter pen and a green rhinstone. Aren't they a great party couple!! So festive and bright!! Lili's Little Fairies Challenge: Missed deadline...there goes my NY Resolution. Crafty Ribbons Challenge: Blue and Green....did not use ribbon which I had intended to use....but she does have a sparkly ribbon in her hair. Glad ribbon was not required. Fussy and Fancy Friday: Furry Friends....my furry friends are dancing the night in their fancy clothes. I used some old rhinestones and the iridescent paper and SU paper are from my stash and very old. And the bears are so warm and fuzzy! First time to enter. Found through Mary Ann. 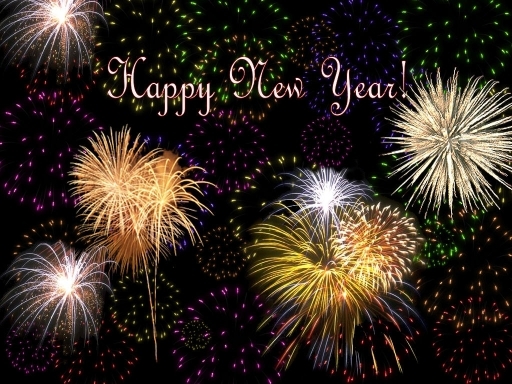 Tuesday Throwdown : Challenge is "Bright and Happy New Year"-use bright colors. Bears are dressed in thier brightest for the New Year Celebration. 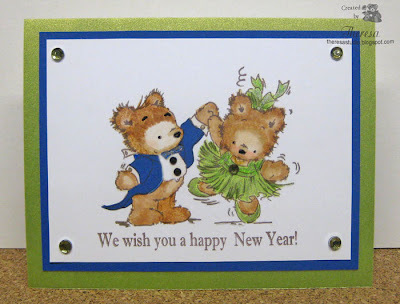 Party Time Tuesday: Celebrate...celebrating the New Year. Tuesday Alchemy Challenge: Share Hopes, Dreams, and Resolutions. Hoping you had a great New Year's Eve celebration. Hello. I am trying to get back in to a routine of blogging. One of my New Year resolution is to post cards earlier and not rushing at the last minute to make a challenge deadline. 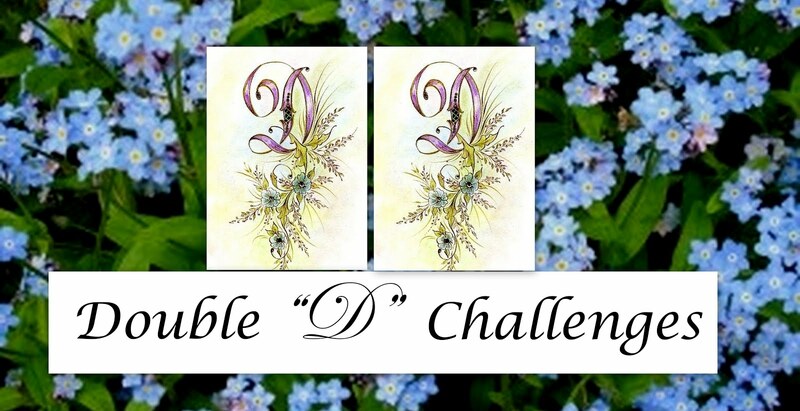 Can you believe I have 8 more days to post a card for Annabelle's challenge? I am usually rushing to get in during the last hour it closes. The challenge this week is the sketch shown below. Was hard deciding what to create but finally made a Valentine/ Love card using Annabelle's digi papers and stamps in a red/white theme with bling. Sweet Stamping: Seeing double-used double layered hearts for each "Flower"
Stamps: Annabelle Stamps' Squared Posies and All Things Grow. I am proud I am early for these challenge deadlines ... of couse, Annabelle has extended their time to enter so that made it easier. It is still white with snow on this second day of the New Year. Welcome to another Winter Card. I had planned this card for Craft a Scene challenge but forgot to post. I have used this digi image from Digi Doodle before and almost colored it the same as the first time after printing on white card stock.. This time I added some birds and a fox for more interest in the foreground and background. Used some embossing on the card base for texture. Love how your eye travels to the little cabin with a touch of red in the background. I will add this to my stash of Christmas cards for next year. 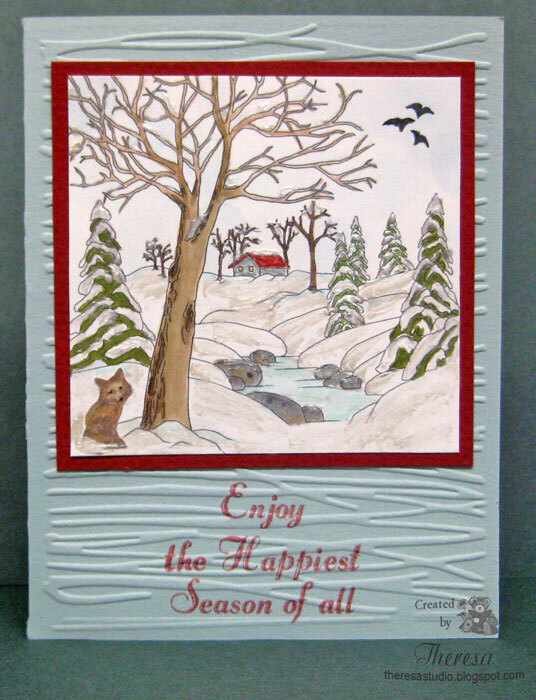 Paper Pretties Monday Challenge:Create a Winter Creation. Stamps: Digi Doodle "Snow Scene", MFP's Fox and Birds, Creative Clear Stamps "Holiday Sentiments"
Each year I make several calendars for Christmas gifts. This year the theme of most of the calendars was Florida Shore Birds using photos by my husband. I would like to share this with you. I used Print Shop and Photoshop Elements to create the calendar. To view all the photos and calendar pages please go to the page Monthly Calendar 2013 at the top of my blog or click here. Other calendars that I made included a Recipe Theme, Photos from my Niece's Trip to Italy, and Scotty McCreery Theme, specially made for my hairdresser. I hope you have time to take a look at "A Year of Shore Birds". Welcome. Stop awhile and enjoy a cup of coffee or tea. Coffee is my choice of drinks. I was playing with a MFP's Stamp "Oh, Beans" and created 2 very different but similar CAS cards. The first is one layer stamped on kraft cs and colored with pencils and oms. It seems a little flat. 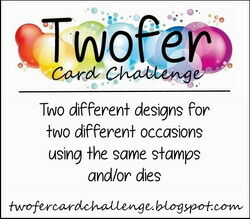 The second card was stamped on white cs, colored with Copics, and attached to a brown card base. Less is More: Challenge is drinks. What is your fave drink...coffee or tea? Mine is coffee which my husband makes every morning...grinding the beans daily and serving me a cup as soon as I get out of bed. Our coffee of choice is Millstone® Colombian Supremo . I will make one of these cards a thank you to him for making each day begin with a steaming cup of java. How great is that?